• BRICS create “New Silken World Order” to bypass West’s monetary stranglehold. In July, world-changing events occurred, portending the approaching end of Zionist-Anglo-American financial and geopolitical hegemony, but they were ignored deliberately by most Western media. On July 8-9, the seventh summit of the BRICS nations (Brazil, Russia, India, China, South Africa) took place in Ufa, Russia. There, the long-heralded New Development Bank (NDB) was brought finally into existence. However, it was not until July 21, following the official opening in Shanghai, that a few media outlets could force themselves to report half-heartedly about it. 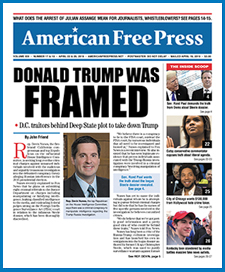 Thanks, however, to analysis by the German-language website “National Journal,” AMERICAN FREE PRESS can bring to readers the deeper significance of the above events. As its own website states, the NDB is a “multilateral development bank operated by the BRICS countries . . . as an alternative to the existing U.S.-dominated World Bank and International Monetary Fund [IMF].” It is thus a sort of declaration of financial war against the international banking cartel owned and controlled by the Rothschild family. Since the infamous Bretton Woods agreement after World War II, which created the IMF and World Bank, the U.S. dollar has been the world’s reserve currency—the one nations have needed to engage in international trade, especially for oil. This has been a boon for the bankers, but not for smaller nations. The final knot in the financial noose was deregulation of commodities futures under former President William Jefferson Clinton, enabling the derivatives insanity. As “National Journal” points out, IMF and World Bank “help” for developing countries always requires those nations to punish their people through “austerity,” while imposing “free trade” and “privatization” of various government enterprises, like public utilities and water supplies, to the detriment of the populace. Basically, the banksters become hidden dictators and seize the nation’s wealth. Multiple African countries that formerly fed themselves, for example, became dependent on giant multinational corporations, as local businesses were forced out and high prices starved the masses. By contrast, the NDB is a positive alternative, whose charter prohibits wild speculation with funds and thus prevents profiteering. Mutual benefit for all parties is sought, not the unbridled exploitation and impoverishment of the common man exercised by the IMF and World Bank. The NDB is intended to create real wealth, not a mere transfer of wealth. As such, it may soon become the lender of choice for those nations tired of IMF piracy. There is also no doubt that the NDB is intended to break the spine of Zio-American world hegemony. Former German Finance Minister Oskar Lafontaine once quoted former Treasury Secretary Lawrence Henry “Larry” Summers: “The IMF is an instrument of American global policy,” intended to preserve U.S. economic and military supremacy in the world. And it is no secret that the BRICS nations seek to break free of that enslavement. But the effort to create a Eurasian economic community, free of Western financial shackles, does not stop with the NDB. Russia and China are developing an alternative gold market, founded on physical possession of that commodity, not pieces of paper. More significantly, there is ever-broadening military coordination and mutual support through the Shanghai Cooperation Organization (SCO), which currently comprises China, Russia, Uzbekistan, Kazakhstan, Kyrgyzstan, Tajikistan, India and Pakistan. Recently, Egypt and Iran have expressed interest in joining. That has the weasels of Wall Street terrified. The Rothschilds never take threats to their debt-slavery empire lying down. The idea of billions of people free of their usurious chains is intolerable, but billions of free people with massive military might to defend themselves have the financial pharaohs frantic. “National Journal” suggests this explains Barack Hussein Obama’s opening to Iran, which is a critical geostrategic crossroads. In order to save their empire, the banksters have left even Israel in the lurch. That same terror may also be behind many of the recent “spontaneous” demonstrations by “hundreds of thousands” of Brazilians against their president. It is consequently no surprise that the sycophantic U.S. military taunts Russia and China on their very borders and is preparing to wage a war of aggression, which can only bring about the—most likely nuclear—annihilation of billions of men, women and children. Insightful article. Like ladysmith says, the Zionist banksters seem to be planning a general depopulation the world over, including these BRICS countries. The Antichrist Zionists’ divide and conquer schemes pit blacks against whites, male against female, Catholics against Protestants, Democrats against Republicans, Christians against Muslims, and all the other divisions by which they incited us to war against each other down through the ages. The Nazi-Ziots control China and Russia, Brazil and India, almost the entire world. The Zionist stance against the U.S. is a war on the American people who they plan to take down just like Czarist Russia. In the new Satanic world they are creating, they plan to genocide 2/3 of the U.S. population. They will start a war and will nuke American cities with a complicit U.S. gov’t and military who they have already turned against the American people. It will be like 9/11, but with a much larger scope. They are very close to getting it all, but they cannot have an armed population in this most evil of all tyrannies. They also have a general depopulation happening the world over, including all of these BRICS countries. Your credibility goes down when you indite (sic) Zionists for financial crimes in your first sentence. Please be more factual, because most think you mean to say Jews. If you indeed mean Zionists, then that includes only a fraction of the population, including many Israeli Arabs who prefer to live in Israel, where they can be free to have a quality education and life. That makes many young Israeli Arabs Zionists. Are they also in your list of Zionists who commit these financial crimes? The term Zionist also includes a few million Jews and their grandmothers, worldwide, out of only 13+ million Jews in the entire world. I am sure most Jews would love to have that kind of financial power. When you throw around the term Zionist, please try to be more specific, or people might stop reading at the first sentence.